A Main Number is a telephone number that essensys will pre-configure with specific phone settings to allow a Client to use this number as the primary inbound telephone number for their business. See the Main Numbers article to find out more. After a Main Number has been activated, the Telephone Manager section of Connect hosts a Main Number Setup page where you and your Clients are able to quickly and easily direct inbound calls to their desired location. This page is accessible by both centre staff and by the Client themselves when they login to Connect. Once inside the Main Number Setup page for a Client, you will have a number of options on how any inbound calls to the Main Number are to be handled. Any changes saved here will be applied instantly to the telephone number. 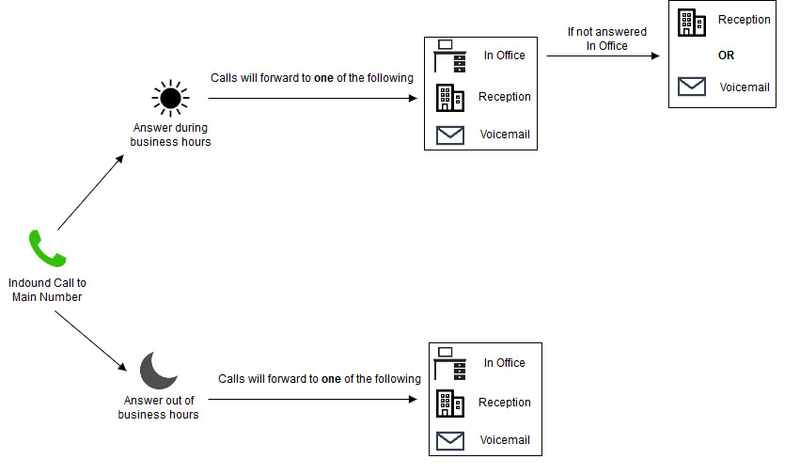 The below image represents a standard call flow for incoming calls to a Main Number. Let's take a closer look at the options available so you can provide the best solution for your Client. Answer during business hours: This is normally Monday - Friday, 8.30am till 6pm unless set otherwise for your site. Answer out of business hours: This is anytime outside of Monday - Friday, 8.30am till 6pm. In Office - This setting will cause the inbound call to the Main Number to ring on all selected DDIs from the Client. These selected extensions will all ring simultaneously. Any extensions you wish to ring should be placed in the right sided column. Any extensions on the left side will not ring. All extensions are included on the right as default. Main Reception - This option is only available to the Client if your serviced office provides a call answering service. If selected, any inbound calls to this Main Number will forward to your call answering service. Voicemail - Any inbound calls to the Main Number will present straight to the Voicemail box of the Main Number. Forward to another number - The Client is able to specify any number of their choosing. Any calls to the Main Number will be immediately forwarded to this number. If not answered: In the event of the phone ringing In Office or Forwarding to Another Number and not being answered, the call can then divert to Voicemail (after 22 seconds) or (after 13 seconds) or be sent to Main Reception (after 13 seconds). Greeting: If inbound calls are forwarding to Main Reception, a greeting can be entered for how you wish the call answering staff to answer the phone. Comment: A comment that centre staff can also see when any calls are forwarded to Main Reception.